for vienne: HAPPY 5TH BIRTHDAY, VIENNE! 5 years ago, today on May 1st, after 6 short hours of very easy (yes easy!) labor, I gave birth to this most beautiful treasure of a little girl! We got to spend 4 years, 4, months, and 6 days withe her - the best days of our lives! 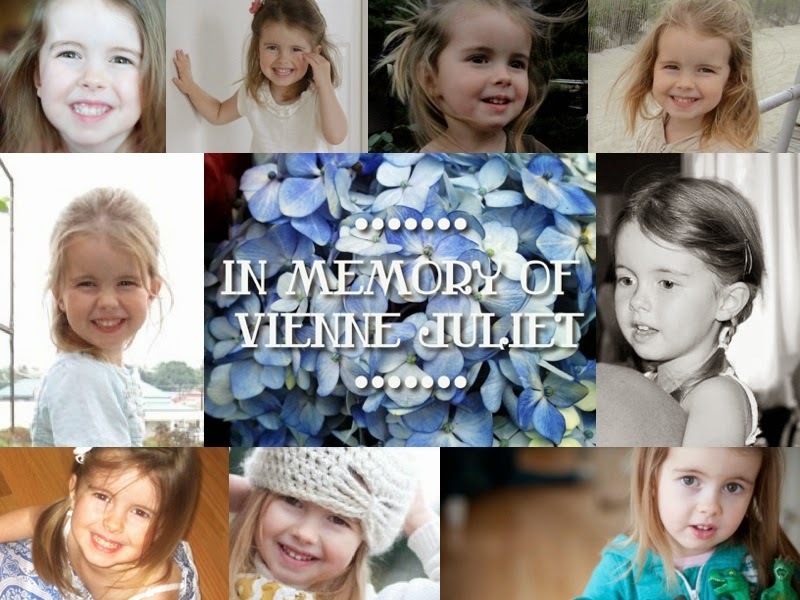 Today, we celebrate her 5th birthday by starting a new May Day tradition of scattering wildflowers in Vienne's honor. Join us in remembrance of her! We have determined that today, this beautiful sunny day, is supposed to be a good day...and so we will celebrate. *Here is one of our MOST favorite videos of her, taken 4 days before her last birthday, last year. Mark is annoyingly trying to confuse her and we love how she finally catches on. Love her expressions. LOVE how she says "because I'm going to have so much fun!". Love the bandaid on her forehead. She is everything perfect. Happy Birthday, Our Sweet Girl! We love you and miss you every single moment of every single day. OH SO PREFECT! How lucky to have that captured. Happy birthday darling girl. I was a little kinder, a little more thoughtful and so much more thankful today all because of you! Wishing you peace as you endure the first of many birthdays without this angel girl. I loved *hearing* this...more intentional about your thoughts and actions. May we all keep those intentions more current. I confess, I grew up in a home that suffered such a loss. My brother died of leukemia when he was 7 and I was 3. I also had an 8 and 4 year old sister. I am a pediatric oncology nurse in Washington. I have an all too deep understanding of this pain you are in, this journey you are on. I cannot explain why I feel such a connection to you or your lovely Vienne. Her name, by the way, is beautiful. I think somehow in my mind, while I know there is no "better way" to have your child die, losing a child slowly over a period of 4 years as my parents did gave them some time to do the things they needed to do. I asked my mom once, knowing what she knows, having seen what she did...would it have been better had he been taken suddenly. She immediately said no. The way your girl left is too sudden. Too shocking. No amount of numbness can dull the acute nature of this pain. But I want you to know it will dull over time. My mama says that it never goes away. It just stops hurting so damn badly! I also want you to know, from a family that is 48 years on the other side, there can and will be room for joy. How wonderful that our hearts are designed with such elasticity as to hold both joy and sorrow simultaneously. You will find happiness, peace and yes, joy. I will continue to hold you and your family close in my heart and prayers. This comment meant a lot to both Mark and I. It was very validating and encouraging for us. Thank you for sharing. Mark and I have said, again and again, how we wish we were given at least a little warning. Yes, the suddenness of her death has been one of the most difficult things for us to process. It's taken us so long just to digest the truth of it. Having to switch EVERY way of thinking, acting, living, talking...everything in just a few moments without notice was beyond debilitating. I walked in numb shock for a long time. And, the trauma of the event, as well, has been very haunting. But, even after just 8 short months of trying to adjust to this difficult new life of living without my daughter, I am seeing a few glimpses of hope. Her birthday celebration, last week really helped in that. We are just trying so hard to focus on Christ's promise that even though she has died, she is still ALIVE with Christ, from John 11:25. That helps us. We just keep telling ourselves that she is alive. We just have to wait to see her. Thank you for all of your prayers and support. It means so much. There's nothing I can say that hasn't been said.... just that your Vienne was a treasure. A joy. A treat. Seth and I were reflecting today how we resent not having spent even more time with her. I remember thinking, 'When the boys are a little older, we can do more playdates.' I don't know what I was thinking. But I do know that it reminds me to pause more often these days and embrace the people in my life more than I embrace my 'schedule'. The birthday parties you threw for little V were so wonderful, including the one today. She was so blessed to have had you and Mark as parents. God DEFINITELY made an excellent choice by trusting Vienne into your hands for her joy-packed, vibrant, sweet little life. Today, I envisioned her in all the places in our yard that she played. I pictured her playing with the cushions on our couch, playing at the play ground, talking in her sweet tiny voice and running in her fantastic way. I miss her so.... My goodness. Thank you, sweet friend. You have stood by my side, through all of this, without wavering. You show me the kind of friend that I want to be. I love you SO MUCH. What I beautiful little girl. She's very precious. I lost my grandson, Ollie, last year. (You know his mama Tiffany). I want to tell you what wonderful, sweet parents you are. I can tell by the kind way you talk to Vienne in the video. I believe you are so lucky to have this child in your home for 4 years. I also believe Vienne was blessed to have you for her parents, to teach her what she needed to know in 4 very short years. I know Vienne & my Ollie are alive & with Jesus. I know that for a fact. Because I know the love my husband & I felt for our children, I know that love never dies & carries on forever. Most of what Jesus taught was pure Love. He is Pure Love. I feel Ollie in my heart, always. I know I will get to hug him one day & give him many kisses. As you said above, you will see your sweet daughter one day again also. Until that amazing day, hold on to Hope. You can do hard things. I send my love & prayers to your family. Thank you so much for taking the time to read this post and leave such a sweet loving comment. It meant so very very much to me. As you know, words of encouragement and support like that are treasures that we grieving mamas cling to. I love your daughter, Tiffany. What a sweet friend she is turning out to be. Of course, I surely wish we did not share in such similar horrific tragedies...but I am thankful to have a friend who knows and understands. Thank so much again. This was a treasure of a comment to me. Much love to you as well.